A Devon shopping centre has banned hooded tops and baseball caps. The ban is part of a new code of conduct at the Drakes Circus centre in Plymouth, which bosses hope will make shoppers feel safer. Any garments which obscure the wearer's face are being banned under the code, unless it is a specific item of religious clothing. The 12-point code of conduct also includes bans on loitering, smoking, shouting and swearing. Managers said bad behaviour would be dealt with severely if the code was broken. They added people would be asked to stop politely, in the first instance. After that, those who did not heed warnings would be asked to leave the centre, or be escorted out. In extreme cases, police would be called and those misbehaving would face a ban. The centre's general manager Mike Jones said: "About 99% of people who have shopped with us over the past five months have behaved perfectly well. But we have had a number of incidents from a small minority during that time. "Now we've observed these people, we've come up with a code of conduct to make it crystal clear that bad behaviour will not be tolerated within Drake Circus." The code does not including banning any religious dress, such as Muslim burkas, niqabs and hijabs. The £200m mall, which has about 654,000 sq ft of floor space in a 6.5-acre site, opened last October. 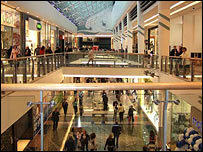 Managers hope the mall will attract 15m visitors a year. When the Bluewater shopping centre in Kent banned hooded tops in 2005, the Children's Society called on young people to boycott the complex.